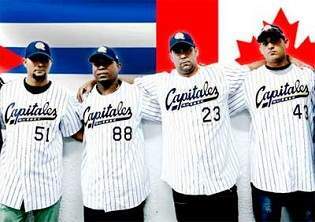 Havana.- Cuban baseball players Alexei Bell, Ismel Jiménez, Yordan Manduley and Yunieski Gourriel will play next season with the Quebec Capitales, team that belongs to the Canadian Independent League, after signing their contracts with that entity. Bell, Jiménez and Manduley will live their first experience in the Canadian baseball circuit while Gourriel will take action for the second time in that event after having been part of that same squad the previous campaign. The four players will join the Québec Capitales on May 7 to begin preparation for the regular stage, which will run from the 21st of the same month until September 15. Higinio Vélez, president of the Cuban Baseball Federation, said that all athletes recruited by the Canadian institution are eligible to join the national team for the USA-Cuba match and Toronto 2015 Pan American Games, both events agreed for next July. Patrick Scalabrini, head coach of the Canadian side, said the team hopes to fight for the title in the upcoming season supported by the talent of the four Cuban players. Ismel Jiménez, Sancti Spíritus´ pitcher and last monarch of the National Series as reinforcement of Ciego de Ávila, said that he will seek to achieve a positive performance in his time by Canadian baseball to demonstrate the values and the competitive quality of the Cuban players. In turn, the outfielder from Santiago de Cuba, Alexei Bell, stated his desire to shine in the baseball circuit of that American nation so that new doors to be open to other Cuban players who can also perform successfully in this tournament.